Quarters commemorating Fort Moultrie at Fort Sumter National Monument of South Carolina enter circulation in late 2016. 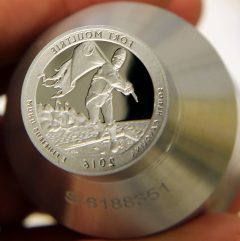 In addition to those struck for general circulation at the U.S. Mint facilities in Denver and Philadelphia, the U.S. Mint in San Francisco also produces a version in proof for inclusion in special collector sets. 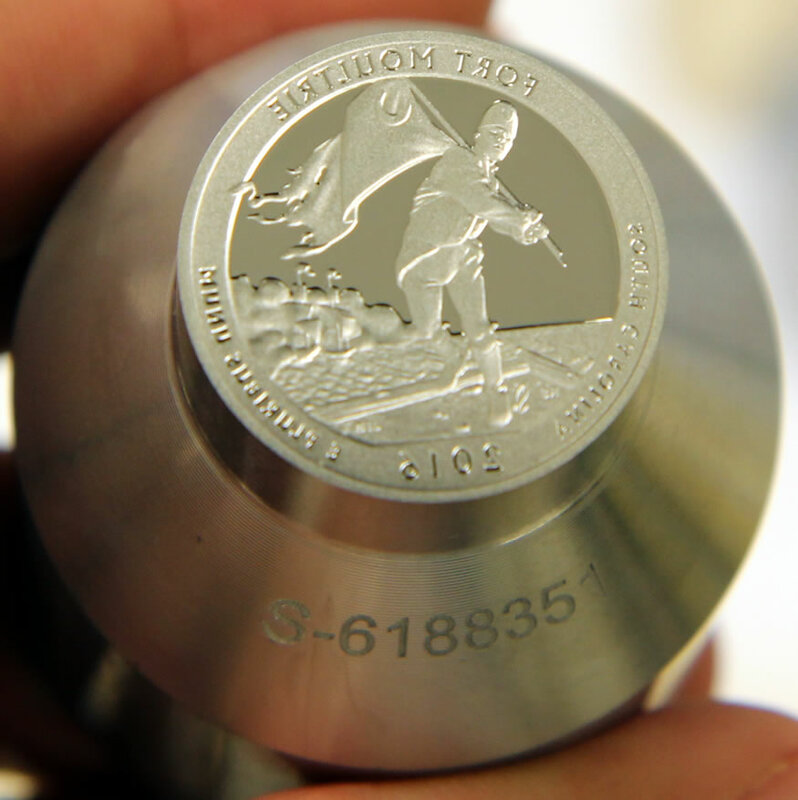 During a recent visit to the U.S. Mint’s facility in San Francisco, we were lucky enough to be able to take a few snapshots of next year’s Fort Moultrie quarter and the dies used to make them. 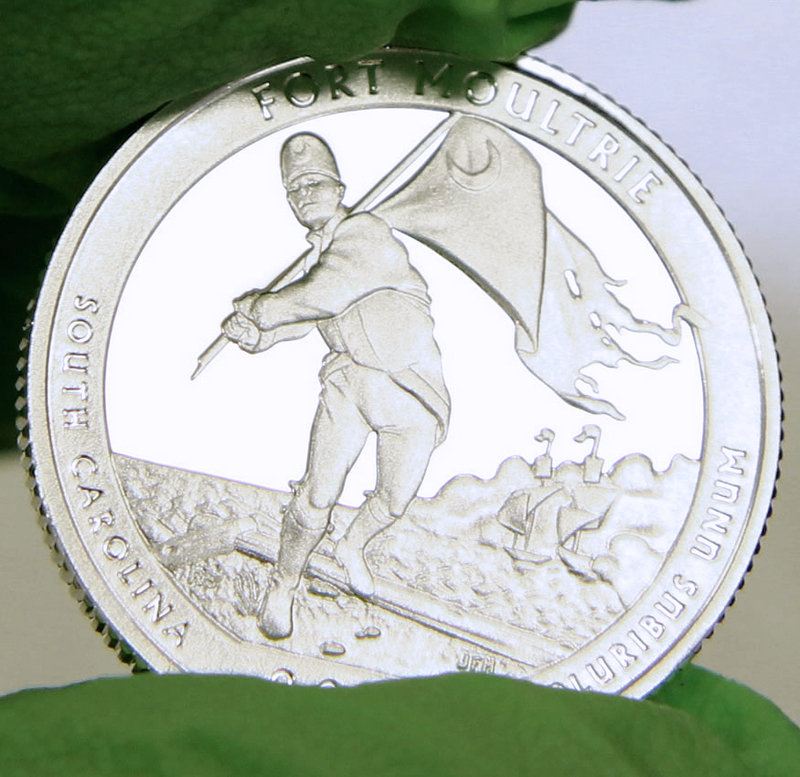 The quarter for South Carolina is the 35th issue in the U.S. Mint’s series of America the Beautiful Quarters and the fifth and last for 2016. 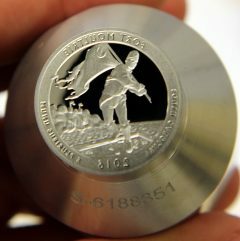 Created by Richard Scott and sculpted by Joseph Menna, the reverse or tails side design won out among seven candidates. 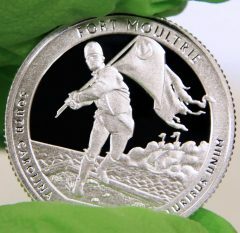 It depicts Sergeant William Jasper returning the regimental flag to the ramparts while under attack from a British ship. 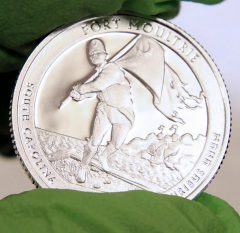 This scene is emblematic of his service at Fort Moultrie during the American Revolutionary War. Inscribed around the design are FORT MOULTRIE, SOUTH CAROLINA, 2016, and E PLURIBUS UNUM. 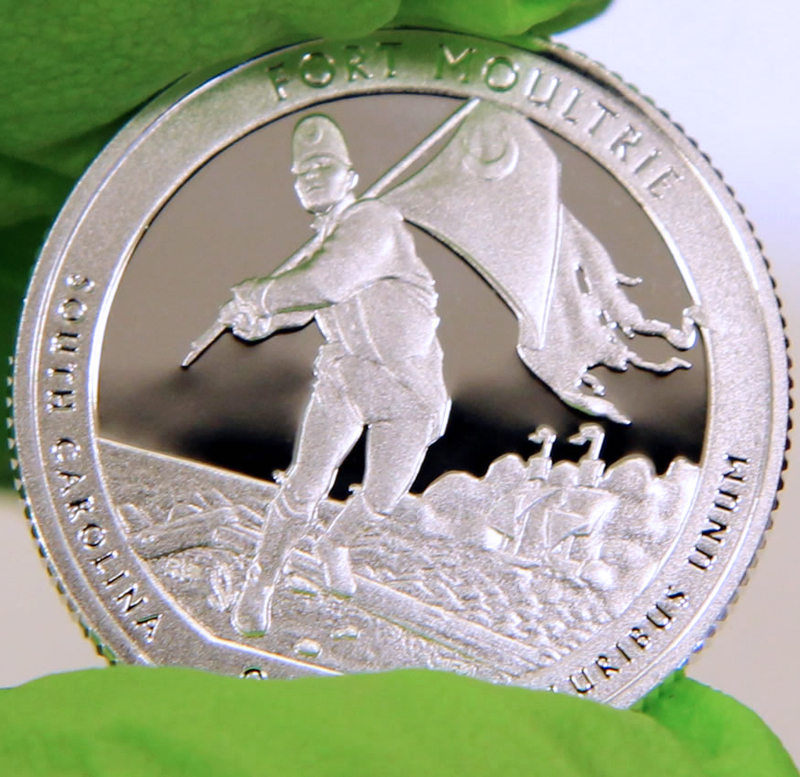 Proof coins feature frosted designs and mirror-like backgrounds, creating a cameo-like appearance that coin collectors find appealing. 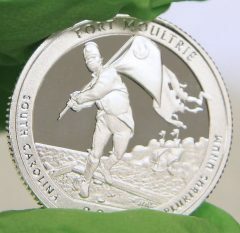 Below are some photos of a proof Fort Moultrie quarter. 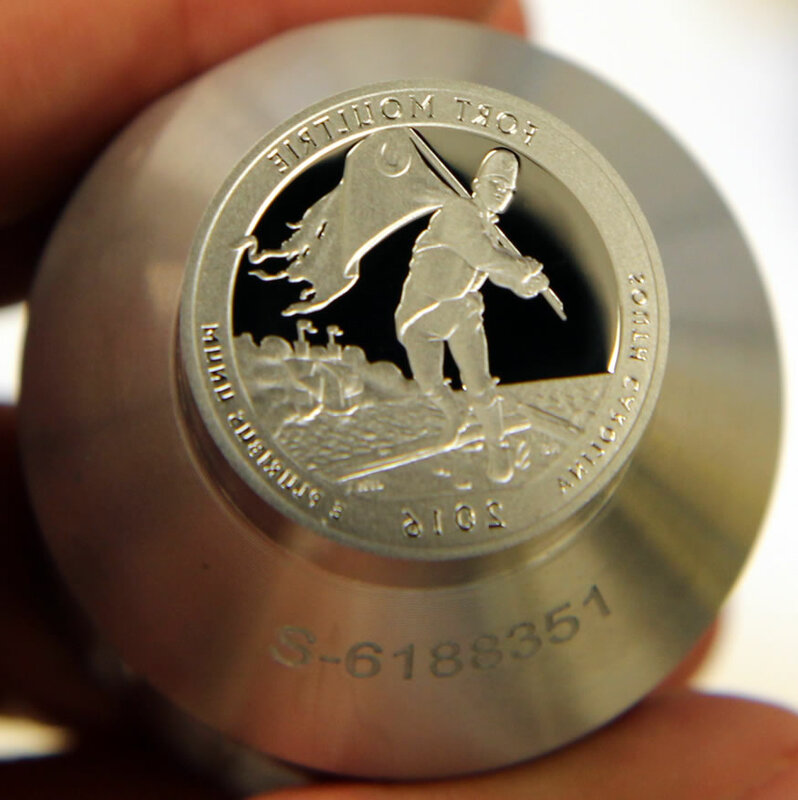 To create collector proof coins, a group of talented employees at the San Francisco Mint prepare the dies that are placed in coining presses to strike blanks into coins. 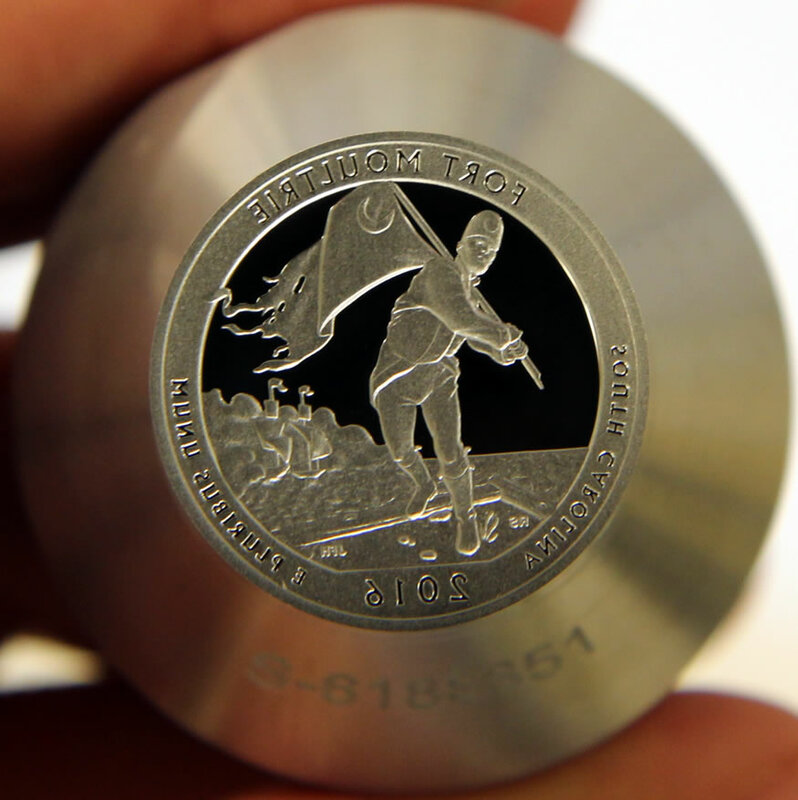 These dies contain identical imagery as those used to make normal circulating coins but they are specially treated and enhanced to produce the proof quality finish. Dies have a coin’s design in negative so they can stamp a positive image. Release dates for the Fort Moultrie quarter are yet to be announced. They include a general circulation release date, an official ceremonial launch date, and a U.S. Mint on sale date. In the past, the last America the Beautiful Quarter for a year has always had November release dates. 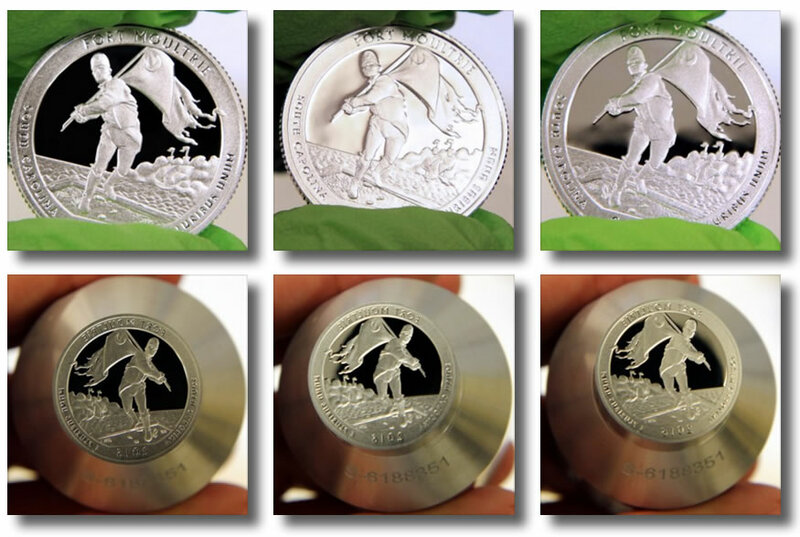 The America the Beautiful Quarters® Program debuted in 2010 and includes five releases annually, each honoring a different site of national interest. Please stay tuned to CoinNews for photos of more 2016-dated coins and articles about our recent visit to the San Francisco Mint. Yawwnn… I didn’t know that South Carolina was taken over by the Turkish. Turkish? Are you referring to the crescent moon? 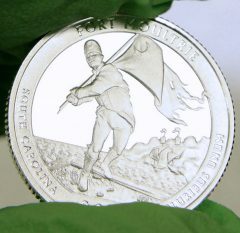 The crescent moon was applied to the SC flag early on, it was the designers wife’s maiden name’s Scottish clan symbol. He incorporated it into the SC flag. And later added the Palmetto tree. The tree was used in the Rev War, because of it’s strength it was used in making the forts, it repealed cannon ball shocks better than more other wood.